As Matt Cutts (Google's SEO and search quality expert) wrote in his blog entry a few days ago, Google PageRank updates are underway. Google updates PR (Page Rank) quite rarely – every three months or so, and it's the most important thing a website operator should be concerned with when it comes to site promotion and popularity. I'm happy to report that Beer Planet's PR went up yet again on this update, from 3 to 4 and my buddy Thaya's PR went up from 2 to 3. He's been blogging a lot more about WordPress, and I think he'll surpass me very soon, thanks to his ingenious plugins. Is it time to check your site's PR? You can use the Google Toolbar, Firefox plugins, like Search Status, or a range of websites that provide this number, like this one. Thank you for the mention. Congratulations on getting to PR4! I didn't even check my blog's PR until I read your post. I'm glad that we have been gaining PR every time there is an update. We should go out to celebrate soon. Let's keep the trend going and bump it up another notch on the next update. Congratulations to both of you on gaining PR.But sometimes I do not understand why this ToolBar PageRank issue makes shockwaves in the blogosphere. It is just a number and it does not really depict the quality of the blog. I have seen some great blogs having a small PR but they are excelling in terms of readership, comments, RSS subscribers, revenue. Clement, generally, a blog with a higher rank will be come up in Google search results higher and more often. The higher the PR, the higher the traffic from Google should theoretically be, all other factors aside. I agree that a blogger should not care too much about PageRank because content is always king. That's also why I don't believe too much in ultra search engine optimizing your blog. Search engine algorithms change regularly, so SEO techniques also has to change with it. Having quality content never gets old, and search engine algorithms are usually tweaked/changed just so it can find *your* quality content anyway. 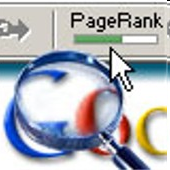 On the flip-side, PageRank updates help passerby readers to quickly identify that your site is credible. I personally believe this gives you a bit more authority when you blog about something. If I see two sites saying conflicting things, I would tend to believe in the site with higher PageRank. I read somewhere that Google keeps internal PageRank numbers updated, but only updates the Google Toolbar PageRank every 90 days. So if you have an internal PageRank of 5 right now then your content will come up with other PR5 sites even though your Toolbar PageRank is still 4. Let me see if I can find the source. Thaya, I was going to include that in my blog post but couldn't come up with the right words to explain it. I never read that anywhere but since there are no traffic spikes as the new PR score updates, one can deduce exactly what you said. It's kind of like keeping a table that caches some statistics so that the main database doesn't get hit with queries all the time. What I don't understand is why Google doesn't just implement a rolling PR update, without specific 3-month timelines. I don't think their BigTables are hurting too much during such updates anyway. I believe that I’ve said before that PageRank is computed continuously; there are machines that take inputs to the PageRank algorithm at Google and compute the resulting PageRanks. So at any given time, a url in Google’s system has up-to-date PageRank as a result of running the computation with the inputs to the algorithm. From time-to-time, that internal PageRank value is exported so that it’s visible to Google Toolbar users (see the question below for more details on the timing). I also read somewhere (I know I'm over playing this) that the PageRank update happens over some unsecure setup and they don't want to risk someone getting into their internal data. Also I think if they publish these values continuously, it will make reverse engineering the ranking algorithm a bit easier. The last thing they want to see is top-paid SEO engineers systematically dictate what shows up in the search results. I do not know if Google updates the pagerank, but I already has over 1 years with a PR4, every time Google does not put it more difficult to attract visitors to our site, Google wants all the web traffic for them, is not just be left to compete and I am trying to get by with Google Adsense.Pero really earn a pittance if you have it 5 to attract more visitors.
.: 85 queries :. : 0.127 seconds to generate cache :. : nexus2 :.